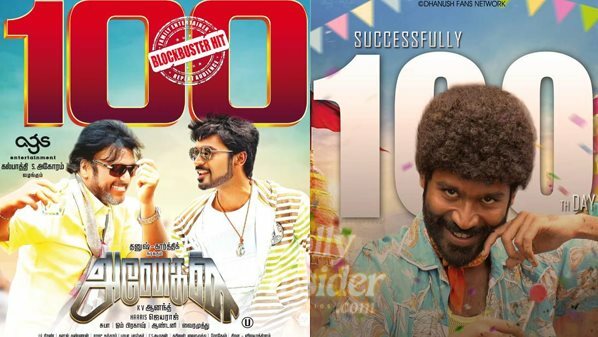 National Award winner Dhanush's latest blockbuster Anegan has completed 100 days on Saturday. This KV Anand directorial, Anegan that released on February 13th has received rave reviews from viewers and critics alike. Bollywood beauty Amyra Dastur played Dhanush's love interest in Anegan, which showcased the lead pair in four different looks in different eras. Veteran actor Karthik got applauded for his negative role in the movie. Ashish Vidyarthi, Aishwarya Devan and others played key roles in this AGS Entertainments production film. Harris Jayaraj's music, OM Prakash's cinematography and Anthony's editing have taken Anegan to next level. Though Anegan has been premiered for Tamil New Year [April 14] in Sun TV, it still managed to bring audiences to theaters.